Made of thick fabric, this cushion cover is 17 inches square so will easily fit 16 inch cushion pads. It has a zip closure, and it's really well made. It doesn't come with a cushion pad, but this was made clear on the listing. Flamingos are very popular at the moment, they seem to be everywhere, so I'm sure this cushion cover will appeal to a lot of people. 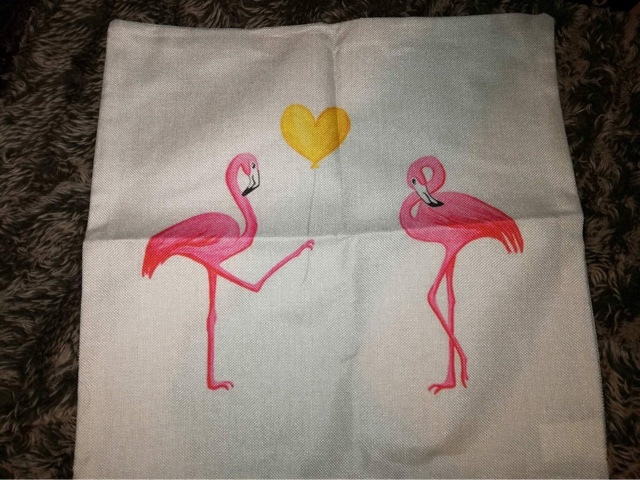 The design is very cute, teenage girls and flamingo fans are sure to love it. It has a romantic theme, so it would also be a great gift for someone you love. The cushion cover is great value and good quality, so I've given it five stars.